Mizzou seems to have catalyzed years of tension over inequality and race. If there's one thing University of Missouri senior Alanna Diggs thinks people are getting wrong about campus racism protests, it's the assumption that they're something new. The demonstrations at Mizzou this month resulting in the ouster of two top university leaders, partly over how they handled various racist incidents on campus, Diggs said, "were not a result of spontaneous combustion." "It was not an overdramatic reaction by a couple of angry black students, but a moment built up over time," Diggs continued. "Many of us behind the scenes have been suffering and struggling with administration and students while trying to deal with class and work. The movement is not over. This is the beginning." The demonstrations at Mizzou's campus in Columbia came on the heels of unrest at Yale University, and have been copied -- complete with demands for resignations --at dozens of other colleges, including Ithaca College in New York, the University of Kansas and Claremont McKenna College near Los Angeles. Protests staged on college campuses last week are the culmination of years of activism around inequality and everyday racism, and incidents pushing racial divisions to the surface. The demands activists are making are reminiscent of similar protests decades earlier. And scholars caution there's no single switch colleges can flip to fix things -- improving racial tensions on campuses will likely take years. "What we are seeing is the beginning of a movement where students and student groups across campuses are finding the courage to speak up about what they have been experiencing," said Yolanda Sealey-Ruiz, a scholar of Latino and black male students, at Columbia University. "I think Mizzou is a catalyst, an inspiration perhaps, but not a one-off event. I think we are also witnessing a reprise to history -- college campuses have historically been places where protest to inequality has taken place." Students are arriving on campus believing racism remains persistent in America today. According to an annual survey of more than 150,000 incoming freshmen by UCLA, the percentage of students who believe racism is no longer an issue has risen slowly over 25 years, from 19 percent in 1990 to 24 percent in 2015. Students of color who've spoken with HuffPost say that does not surprise them, given that students are growing up witnessing high-profile deaths of unarmed black men and teens, like Trayvon Martin, Tamir Rice and Eric Garner. Those experiences are coupled multiple examples of fraternity and sorority parties featuring black face and caricatures of various ethnic groups, while Muslim students at some campuses have been subjected to spying by law enforcement. "We're not that much that different than the people being killed," said Taylor Lemmons, a junior at Claremont McKenna College. "Just because we're going to get a degree from these shiny institutions doesn't mean we're that much different." In some cases, students who say racism is still a prevalent issue have been proven right. The University of Alabama's sororities didn't begin accepting black women as members until 2013. In March, fraternity brothers in Oklahoma were caught on video singing and laughing about lynching black men -- racial slurs included. "We're living in a time where issues that haven't been appropriately attended to for a number of years are getting much more attention," said Benjamin Reese Jr., Duke University's chief diversity officer. "I don't think students suddenly woke up to things. I think they're reacting not only to the events on campus and incidents around the country." Brown University senior Armani Madison said part of his discontent with his school is fueled by demands made by black students in 1968, 1975 and 1985 that "have yet to be fulfilled, despite university promises." Activists at Occidental College noted their demand for a black studies major has existed since 1968. Students of color have organized campaigns at Colgate University, the University of Michigan, UCLA, and Harvard, among other schools, to highlight inequities. 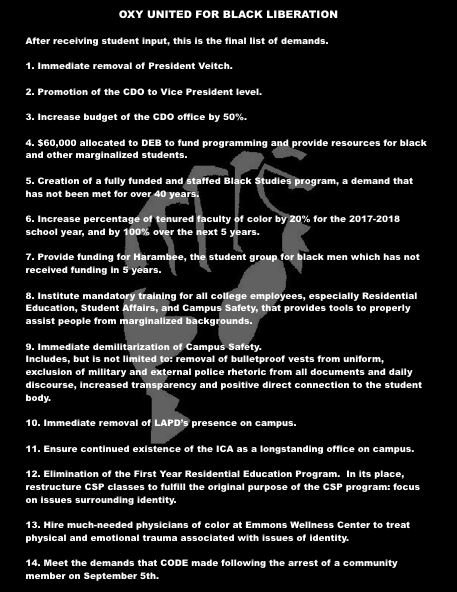 Some of these demands at Brown, Mizzou and elsewhere are for an increase in the percentage of minority students and faculty. More selective colleges are still disproportionately white compared with the general population, data from the Georgetown University's Center on Education and the Workforce shows. College presidents, football coaches and professors all are much more likely to be white, too. Black students are less likely to graduate within six years compared with their classmates. But even increasing the percentage of students of color on campus is not enough, insisted Deborah Bial, founder of the Posse Foundation, which partners with colleges to place minority students. "It's the responsibility of every institution to be transparent to have as many ongoing conversations as possible, to create forums, to use every resource they have from the president to the students themselves," Bial said. "And the conversation shouldn't just be happening one time." Activists also are demanding changes to curriculum to address diversity and an administrative acknowledgement of barriers that students of color face. Students of color say they're constantly reminded that they are "different." Reine Ibala, a senior at Yale, described either feeling "invisible" on campus, or like she was an intruder and couldn't rely on bystanders to help if something happened. "The thing about being black on a college campus in an urban area is that your color -- in my case, my blackness -- at times puts my status as a student in question," Ibala said. "Here in New Haven, the assumption is first that I am a 'townie.'" Students protesting on campuses told HuffPost their demonstrations were not simply about offensive Halloween costumes, misguided emails from administrators or one person shouting the N-word. The emotional response,which sometimes receives backlash, comes from dealing with years of feeling like administrators aren't trying to make things better for them. "It shouldn't take days of our tears and anger to move an administration to listen," Ibala said. Transparency during the next steps will be critical, said Reese, president of National Association of Diversity Officers in Higher Education. Reese recommended including students in assessing what steps a college will take to address racial issues -- something activists are demanding at Mizzou and Claremont McKenna, among other campuses. But in the near term, both Reese and Bial emphasized that colleges will have to be quicker to respond to individual incidents of racism. "It's important to say this happened and we're not okay with it, and it's important for students to say it as well -- I can't emphasize that enough," Bial said. "Students can't give up the power they have to voice opinions about what's okay and what's not okay." Vernā Myers, a diversity consultant and author, said now that Mizzou has served as a spark, protests against campus racism won't go away. "This generation didn't think they'd have to go through something like this," Myers said. But now, they are empowered to do so, and "they're going to help our country live up to what we say we believe." Tyler Kingkade and Lilly Workneh reported from New York, Ryan Grenoble reported from Denver. You can contact the authors at tyler.kingkade@huffingtonpost.com, lilly.workneh@huffingtonpost.com and ryan.grenoble@huffingtonpost.com.